Bob Taylor was a curious and inventive lad by nature and by the time he was a freshman in high school, he had constructed his first guitar: a twelve-string. Two more guitars were designed and assembled by the time he had graduated from high school but this was only the beginning of his love affair with the inception and construction of high quality guitars. 1973 brought Taylor to the "American Dream", a small guitar shop in Lemon Grove California which not only compelled him further in his search for insight into the world of guitar construction but also introduced him to an individual by the name of Kurt Listug. Listug also worked for the American Dream and when the owner opted to sell out, he and Taylor jumped on the opportunity to start their own business. Taylor and Listug brought another man aboard by the name of Steve Schemmer and the three of them purchased the American Dream and renamed it "Westland Music Company." In 1976, the three decided that Westland was a little too long to fit on the headstock so the company was renamed Taylor, in lieu of its brevity as well as its American sounding connotation (as compared to Listug!). The organization overcame a number of obstacles characteristic of any new business but Bob Taylor's illustrious and innovative nature shown through and helped the company to survive and eventually thrive. Using the Guild D-37 as a template for ideas that he would later apply to his own guitars, Bob designed a bolt-on neck design (known as the New Technology Bolt-on Neck System) that would later become renown and coveted in Taylor guitars. Taylor has continued to lead the pack in design as well as progressive manufacturing techniques that have helped them to become one the world's foremost producers of fine guitars. The Taylor 110 Dreadnought Acoustic guitar has a beautiful radiant solid Sitka Spruce top with laminate Sapele back and sides. Sapele wood is often compared to Mahogany and is known for both its beauty as well as its durability. 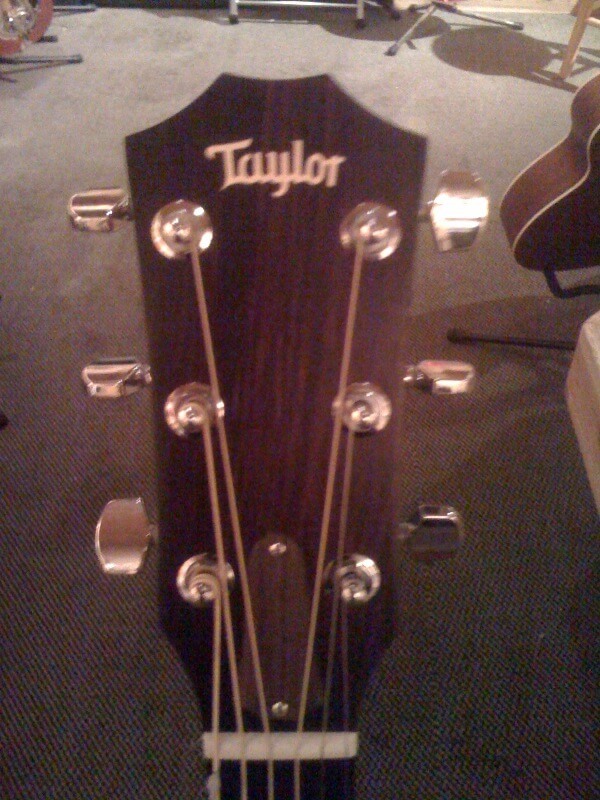 The Taylor 110 also utilizes Sapele for the neck but features ebony wood for the fingerboard and the bridge. The nut and compensated saddle are composed of Tusq and the entire body is sealed in a handsome Matte Varnish finish which is the end-product of a special drying process designed by Taylor. The Taylor 110 falls under the classification of the dreadnought and measures 20" long by 16" wide (at its widest point) and is approximately 4 and 5/8" deep. Width at the nut is 1 and 11/16" and the ebony fingerboard consists of 20 frets, 14 of which are accessible. This guitar also features an adjustable truss rod, and x-bracing for added strength. The Taylor 110 Dreadnought Acoustic is available in your finer retail outlets as well as directly from Taylor themselves and will set you back anywhere from $600 to $800, depending on where you acquire it. In lieu of the solid quality materials, the painstaking construction and finish process, as well as the the guitar's great playability it seems well worth the expenditure. The Taylor 110 also comes with a gig bag as well as Elixir strings which have been found to be optimum for this particular guitar. 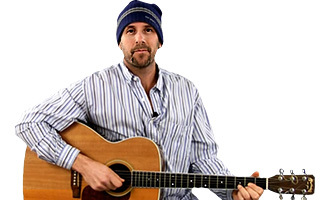 The Taylor 110 Dreadnought struck me as being a solid guitar from the moment I picked it up. It has a balanced feel to it and the sound reflected this quality as well. The guitar rang cleanly through the treble tones and also reflected a great balance between the mid and bass range as well. Resonance was great and filled the room with beautiful radiant sound as I strummed the guitar. The action was also superlative from the 1st to the 14th and played well all over the fretboard in general. Yes, the Taylor 110 costs a little more than guitars in the 2-4 hundred dollar range but you can really appreciate the difference in the craftsmanship as well as the materials from the moment you begin to strum this instrument. 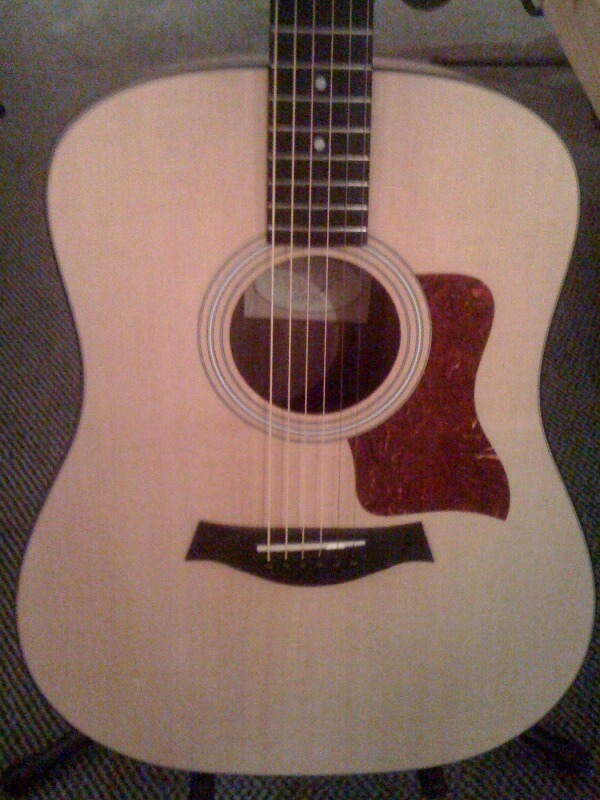 If you want to acquire a great instrument that is still reasonably priced,the Taylor 110 Dreadnought is a great buy.